I’m compelled to respond to certain comments that have become regular and flippant in our society when relationships go through difficulties or come to an end. Often I see sarcastic pictures depicting the scorned woman whose man didn’t live up to her expectations, and either continues to make her life miserable or is no longer part of her life at all. 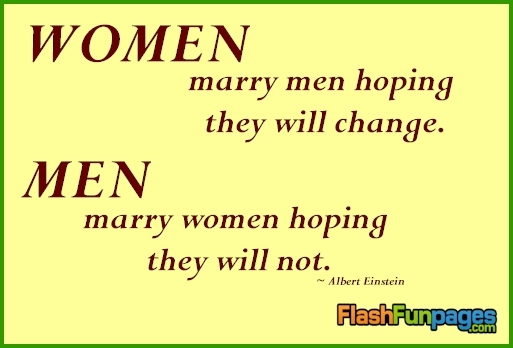 I’m no marriage expert, but I do know something of the dynamics between men and women, what works and what doesn’t work. I’m not singling out women here to lay blame; it just happens that most of what I hear is from the women’s perspective, so that’s what I’ve chosen to address. I’ve had people tell me that I was “lucky” to have such a good husband and be married for twenty-nine years, through thick and thin. I had a very good thing, there’s no doubt, and I will be forever thankful for what I had, but I don’t believe it was lucky. I think it had a lot more to do with character and commitment, and the fact that we knew each other well enough before we got married to know that we wanted the same things, that we shared goals and dreams together, and that we saw each other not only at our best before we married, but also went through times of trial and saw each other in our less than stellar moments. We had an open and honest relationship before we decided to join our lives forever. All relationships have irritations and annoyances because we’re all human. There wasn’t anything that irritated me during our marriage that I didn’t notice before we got married, and I know Pat could say the same. I wasn’t starry eyed and blinded by love, I knew I loved him and made the decision to be with him despite the human imperfections, and clearly he did the same with me because I was always much more of a handful than he ever was! Yet, when I hear people talk today about things that went wrong, they often admit if questioned that they did notice things while dating – sometimes big things – but they dismissed them, thought the other person would change, thought that after the marriage things would be different. How often does that really work out? Yes, we sometimes mellow with age, but I’d just like to say that if the guy you’re dating is selfish, a drinker, inattentive, jealous, wastes money, disrespects you in any way, treats his family poorly or has family that treats you poorly, and any of these things – or numerous other possibilities – bother you, make sure they are things you’re willing to accept forever or don’t get married, and don’t make babies with him. And if you do ignore them or the advice of others around you who try to help you see them, don’t be surprised when things don’t change and you’re left unhappy or divorced. Yes, there can be something big that arises out of the blue that wasn’t foreseen by anyone, but I’m speaking here about the most frequent situations where people can identify something early on and look back later and know they saw it, or at least signs of it, but went ahead anyway, or rushed in before they had enough experience with each other in various situations to have a pretty good idea of how things were going to be. If women rush into relationships even despite advice from family and friends to the contrary – and they have many reasons for doing this that I don’t claim to understand – they often end up in marriages that aren’t fulfilling and they either feel trapped or they’re alone again after it ends. The sad thing is that frequently they become bitter and resentful towards men, marriage, and relationships in general, without recognizing that perhaps it’s their own life and way of approaching dating and marriage that is causing their choices and resulting unhappiness. I wasn’t perfect, but I did take the time to know my future husband, to know his strengths and weaknesses and how those meshed with my own, and nothing in those areas really changed for us in all the years we were married, except that we grew and matured and developed our relationship together and over time it became stronger. The irritations didn’t disappear, but we learned how to better manage them and sometimes each of us was able to make changes in our attitudes and behaviours to please the other. And we always understood that we would be together until the end, imperfect as we were, disagreeing here and there, arguing once in a while, and loving each other more and more as we aged. So was I “lucky”? Was I living some fairytale? No. I lived in a real life marriage with ups and downs and hard work and many rewards and lots and lots of love. And we know that even the characters in good stories don’t end up with happily ever after, because eventually one of us is gone forever and the other is left behind to mourn the loss. I just find it sad to see how many people today don’t seem to get it. They either rush in, or rush out, or repeat patterns of behaviour that give them disappointing results over and over again, and they miss out on what they seem to really want but never find. I think somewhere along the way maybe they need to change themselves and their way of doing things before they can expect their story to change. Just my two cents.